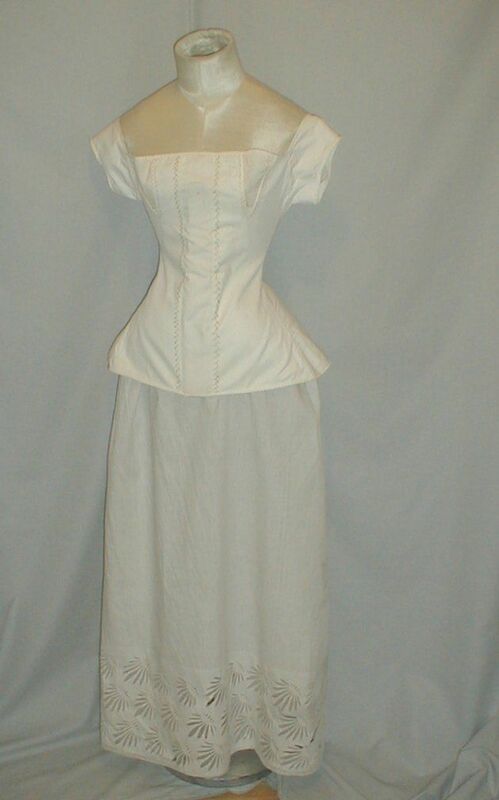 An early 1820’s embroidered cotton corset and cotton under slip. The under slip has been de-accessioned form the Brooklyn Museum Collection. The corset and under slip are both hand stitched. The corset is embroidered with light and dark gold feather pattern. The bust line has two gussets that are each embroidered. The back has hand stitched holes for lacing. The lacing is not included and is for display purposes only. The corset comes with it original kid leather busk. The corset is in very good and clean condition. There is one tiny hole in the center front bust area. 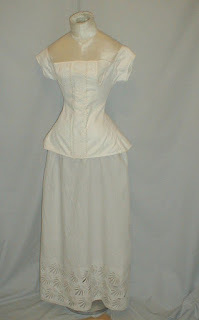 Bust 30 Waist 20 Length 19. The under slip hemline has a crown like styled decoration with inserts of fine muslin. The petticoat has an adjustable drawstring waistline. The petticoat is in good and clean condition. Several of the hemline decorations are missing the muslin insert fabric. (See photos.) Length 37. I tried to find the original museum description but couldn't. I did find a couple of similar cut stays in the Met's current collection, however. According to the Met these both date to the 1820's. I'm tempted to think these are really 1830's based on how off the shoulder they are but they are from the early Romantic period either way.